Jan Lehnardt is an Open Source developer. He works on all parts of the web stack and tries to make things easier for everyone. 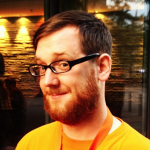 He’s a core contributor to Apache CouchDB, a co-curator for JSConf EU and lives in Berlin.